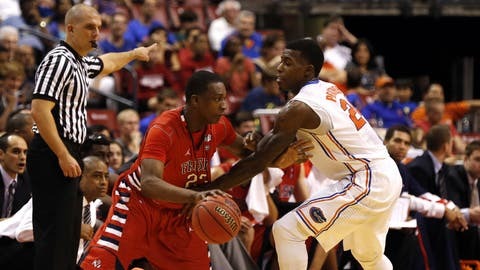 Florida Gators forward Casey Prather (24) drives to the basket as Fresno State Bulldogs forward Alex Davis (10) defends in the second half at the BB&T Center. SUNRISE, Fla. — Considering Billy Donovan devoted the bulk of his team’s practice time the last few days to defense, there wasn’t a whole lot of criticism he could rain on his players after Florida went into the halftime locker room Saturday afternoon leading Fresno State, a team known for bombing 3-pointers all day long, by just four points. The Gators had shot 29 percent, missing a handful of bunnies, bricked 12 of their 13 shots from 3-point range and missed half of their eight free throws. Starters Scottie Wilbekin, Dorian Finney-Smith and Michael Frazier II were a combined 1-for-16 from the floor and 0-for-12 from the arc. The offense was turn-your-head-away ugly. But UF led the game by four. Will Yeguete grabbed a season-high 10 rebounds -- five on the offensive end -- to help Florida hold off Fresno State. "As a coach, when you put an emphasis on things in practice and see those gets fulfilled during a game …," Donovan said, his voice tailing off. "I was pretty happy." The offense eventually came around. While UF’s defense maintained its edge, senior forward Casey Prather scored 16 points on 8-for-11 shooting and his teammates’ collective shooting eye refocused after intermission in plenty of time for the 16th-ranked Gators to run out a 66-49 win over the Bulldogs before 11,214 on hand at the BB&T Center for the Orange Bowl Classic. In winning its third straight, Florida (9-2) shot 57.7 percent in the second half, went 4-for-5 from 3-point range, and maintained relentless rebounding effort by pummeling Fresno 47-24 on the glass, including 20 boards on the offensive end. Senior forward Will Yeguete finished with nine points and a season-best 10 rebounds in clearly his finest game of the year. Senior center Patric Young, who did not practice Friday and did not start the game, came off the bench to score eight points and grab nine rebounds. Wilbekin, after a 1-for-7 start (0-6 from 3) chipped in 11 points, six rebounds and three assists. "I think it was our best games defensively all year," Yeguete said after helping holding the Bulldogs (6-6) to a season-low point total and 27 under their season’s average of 76 per game. "We were consistent for 40 minutes. In others, we had breakdowns. This one, we had less breakdowns. We’re getting better." After a roller-coaster defensive ride in Tuesday night’s defeat of Memphis in New York, Donovan brutalized his team over the three practice days, pounding away at the need to upgrade their intensity and execution when it came to guarding the opponent. Enter Fresno, a team with nowhere near the pedigree of UF’s last four foes — Florida State, Connecticut, Kansas and Memphis — but with a roster of 3-point shooters cocked and ready to fire away. Getting his players to take the task seriously, especially coming off that four-game attention-getting spree and with Christmas break kicking in after the game, was something of chore. But the Gators came around. "We made it hard for them," Donovan said of his team’s defense against the Bulldogs. "They weren’t able to score quickly against us and we made them have to go deep into the clock in their offense. Our rebounding margin was good, and we were very, very active." They weren’t very accurate on offense, however. Fresno played mostly from a 2-3 zone in the first half and the Gators neither moved the ball well against it nor finished plays when they got to the rim. "The stats were mind-boggling because of the shots that we missed," Donovan said. "Never mind the 3-point shots, I’m talking about the ones around the basket." UF was 9-for-31 in the first period to Fresno’s 6-for-23. But of those latter stats, the Bulldogs only got off five attempts from the 3-point line. Hence the level of encouragement at halftime. "We went into the locker room with a lot of passion," said Bulldogs guard Cezar Guerrero, who led all scorers with 17 points. "We thought we could do it." The Gators, meanwhile, were locked in on playing better offensively. "We knew we had to come in the second half strong," Prather said. "We had to be more aggressive." Prather made a driving shot to start the half. Then Frazier hit a 3-pointer. That made it a 9-point lead. And little by little, the Gators took it out from there, hitting a double-digit lead less than four minutes in on a short jumper by Prather; then a 15-point margin at the 12:27 mark when freshman backup point guard Kasey Hill drained his first of two second-half treys. The offense picked up and the defensive intensity stayed the same. The Bulldogs finished with just four made 3-point shots and the last one came on a half-court jack as the final buzzer sounded. But UF had a good, solid win under far less than ideal circumstances. "We’ve just been trying to focus every day to be as hungry as possible on defense every game," said Prather, who was voted the event’s Most Valuable Player. "I still think we can get better in a lot of areas." The coaches certainly agree that everything about the Gators can improve. For now, that’s a task that can wait until everyone comes back Thursday from a four-day break for the holidays. "Now we can have a good Christmas," Yeguete said. "It’s better to look forward to going on a break with a smile on your face," Young said. "When we get back, we’ll have to fight human nature. We don’t want to settle, we want to improve and not have any setbacks."